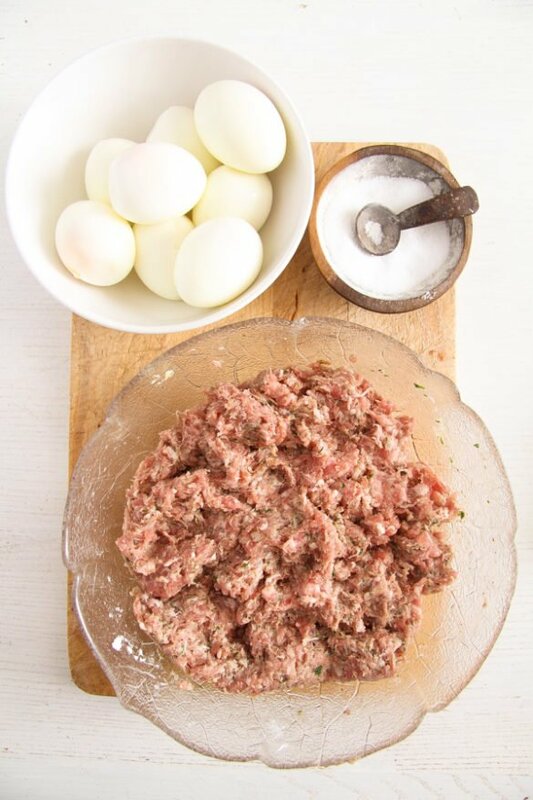 A classic, traditional Scotch eggs recipe made with hard boiled eggs, sausage meat and herbs. 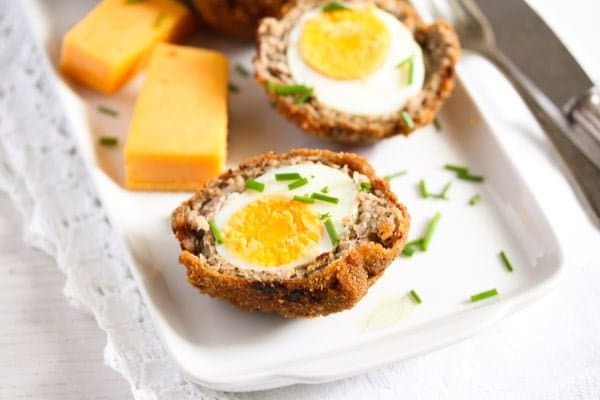 A Scotch egg is a snack consisting of a hard boiled egg wrapped in a sausage meat casing spiced with herbs and other spices, coated in breadcrumbs and traditionally deep-fried. It is a common picnic food in the UK, and it is sold not only in supermarkets or corner shops, but more notoriously at motorway service stations. That is where I bought Scotch eggs for the first and only time in my life, two years ago during our holiday in the UK, at a motorway station, somewhere on our way from Scotland to Wales. They were a total disappointment! Cold and gray and totally bland. There were two of them in the plastic package and I thought about each of us having half a Scotch egg in a bun. Well, my husband and I shared one because we were really hungry, but the kids nibbled a bit at it and preferred to eat the bun on its own. But I knew there must be something more behind it, no bad food can become so famous! And the ingredients are all promising actually, I mean eggs, sausage and spices, all things I like! And yes, you are right, who buys packaged food at a motorway station and expects it to be good? I know, but we were really hungry and miles away for any proper food. It was that or packaged cheese, which might have been the better choice in the end. So, because I was so sure that these famous Scotch eggs must be good, I thought about making them myself at home. And I did, and they were great!!! So good, that after making them only twice, they have become one of my daughter’s favorite foods. If you ask her what her top three dishes are, Scotch eggs come on the second place lately. Number one are still the Zucchini Feta Pancakes with Herbs. 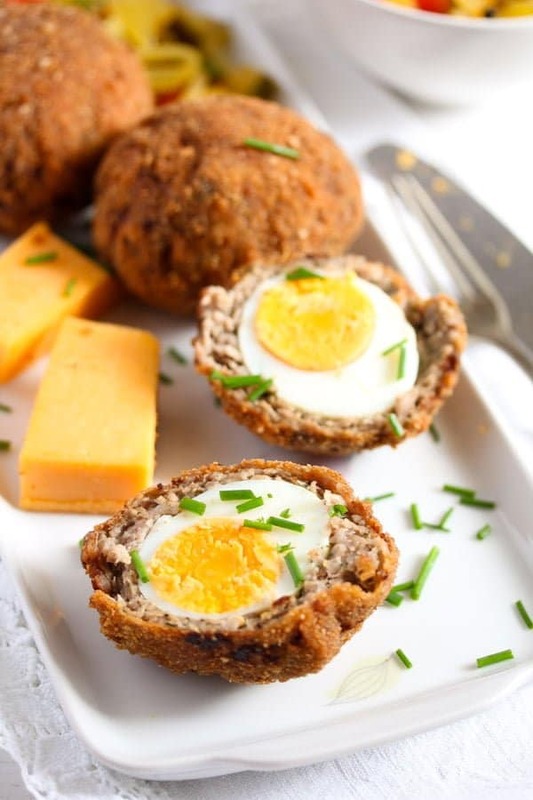 The Handmade Scotch Egg Company also mentions Neil Chambers who claims that the Scotch eggs were a northern variant of the Cornish pasty produced by Scottish smallholders. 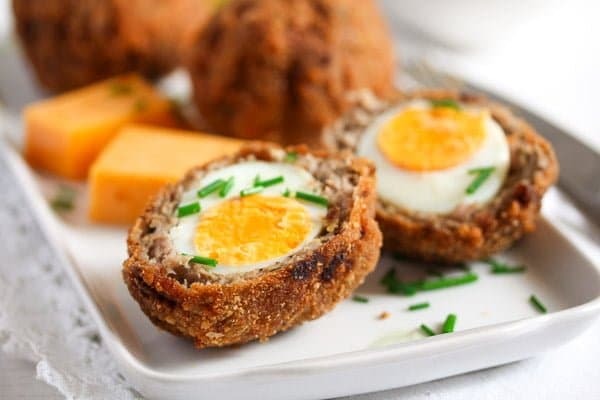 How to make Scotch Eggs? Making Scotch eggs might seem daunting due to the many layers it has and (for me) the fact that they have to be deep fried. But, trust me, with a little bit of organization, they are really easy to make, things will go much faster than presumed. Step 1: Boil your eggs or use leftover hard boiled eggs. To cook the eggs, give them to a saucepan, cover well with water and bring to a boil. Remove from the heat and let stand, covered, for 5 minutes. Drain and give to a bowl of iced water. Let stand for about 5 minutes. Peel the eggs. Let them cool down while you prepare the rest. Step 2: Prepare the sausage and spices mixture. Remove the skin of the sausage and mix the meat with all the spices. Step 3: Wrap the eggs into the sausage meat mixture. You can either do that in the palm of your hand by giving a good portion of the meat into your hand, pressing it flat, placing the egg in the middle and carefully yet easily encasing the egg in the meat. Or you can cut a large piece of cling film, give one portion of meat on one side of it, fold the other side over and press the meat with your hands or a small rolling pin into a rather oval form. 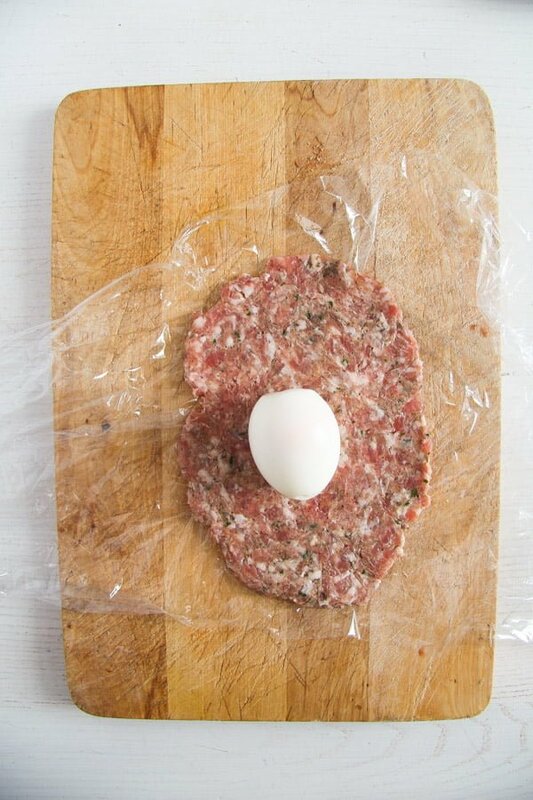 Place the egg in the middle, wrap the meat around it and form a slightly elongated ball. Step 4: Coat the Scotch eggs in flour, lightly beaten eggs and breadcrumbs. to check the temperature, if you have one, if not give a small piece of bread to the hot oil and leave it for 1 minute. If it sizzles and browns during this time then the oil is hot enough. Fry the eggs for about 4-5 minutes or until nicely browned. Take out with a slotted spoon and fry the next batch. 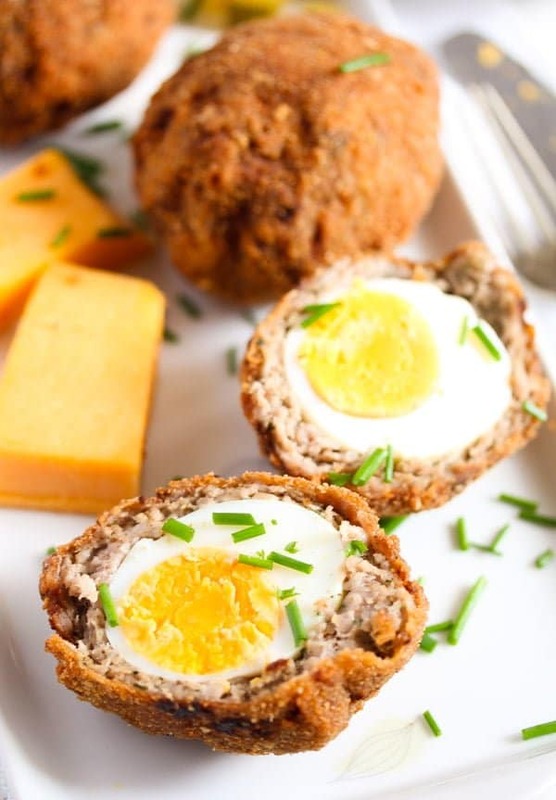 What to eat with Scotch Eggs? You can serve the Scotch eggs hot with a dip, for instance a hot dressing or tomato sauce. I also served the Scotch eggs with mashed potatoes, not traditional I suppose, but totally delicious. On the side we had pickles, my Sweet and Sour Zucchini, Pepper and Onion Pickles, they were a perfect match. 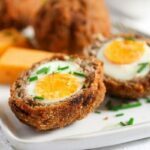 But any other pickles that you like, should be OK.
You can also serve the Classic Scotch Eggs Recipe – Fried, with Sausage and Herbs cold, at a picnic or a party. In this case, I would make sure to have some mustard, some chutney (not a very sweet one), some chili sauce or another hot sauce. Pack some pickles as well, some bread and maybe some nice Cheddar cheese. 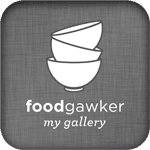 Can Scotch Eggs be reheated? Scotch eggs will keep well in the fridge for several days, at least 3 or 4. They can be eaten cold at any time or they can be reheated in the oven at about 180 degrees Celsius/ 360 degrees Fahrenheit for about 10 minutes. Boil your eggs or use leftover hard boiled eggs. To cook the eggs, give them to a saucepan, cover well with water and bring to a boil. Remove from the heat and let stand, covered, for 5 minutes. Drain and give to a bowl of iced water. Let stand for about 5 minutes. Peel the eggs. Let them cool down while you prepare the rest. Remove the casing of the sausages. Give the sausage meat to a bowl. Add the pepper, salt, nutmeg, sage, thyme, parsley, cornstarch, Worcestershire sauce and mustard to the meat. Mix well with your hand. Divide the meat into 8 equal portions. 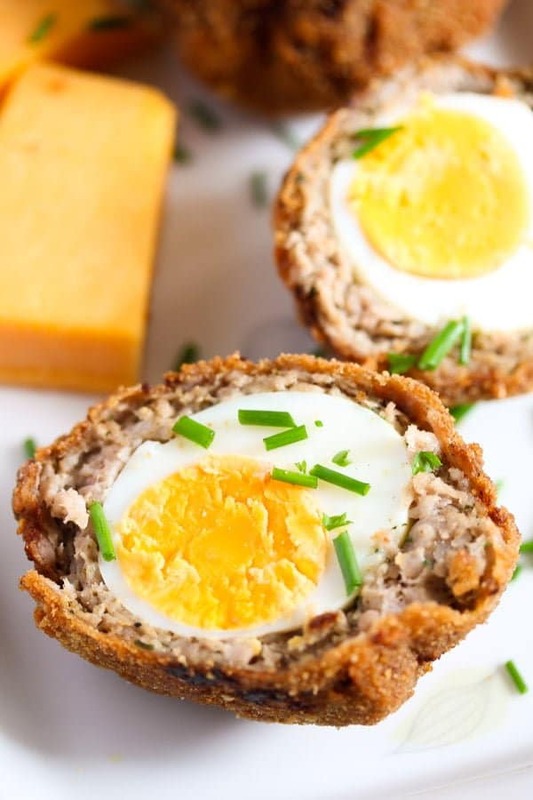 There are two ways to form the Scotch eggs. You can either do that in the palm of your hand by giving a good portion of the meat into your hand, pressing it flat, placing the egg in the middle and carefully yet easily encasing the egg in the meat. 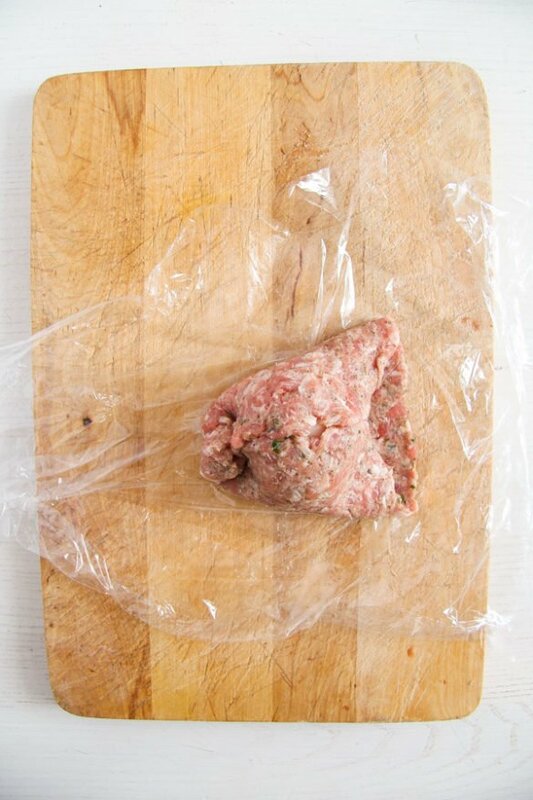 Or you can cut a large sheet of cling film, give one portion of meat on one side of it, fold the other side over and press the meat with your hands or a small rolling pin into an oval form. Place the egg in the middle, wrap the meat around it and form a slightly elongated ball. When all the balls are formed, give the flour onto a large plate. Beat the eggs lightly in a bowl and give the breadcrumbs onto another large plate. 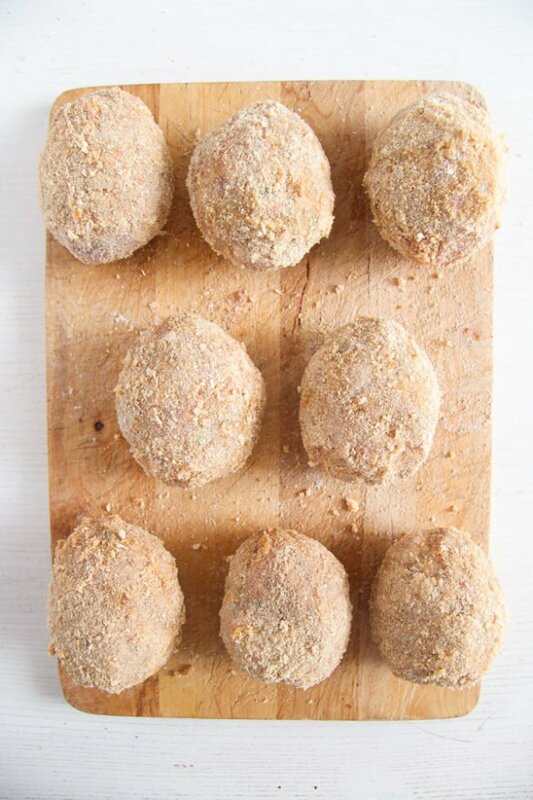 Turn the Scotch eggs first into the flour. Pat gently to remove the excess flour, then turn the balls into the eggs and then into the breadcrumbs to form a nice coating. to check the temperature, if you have one. If not, give a small piece of bread to the hot oil and leave it for 1 minute. If it sizzles and browns during this time then the oil is hot enough. Fry the eggs for about 4-5 minutes or until nicely browned, turning a few times in between with the help of a slotted spoon. Take out with a slotted spoon and fry the next batch. Yours turned out perfect, Adina. Happy Spring! Thank you, Angie. Happy spring to you too. 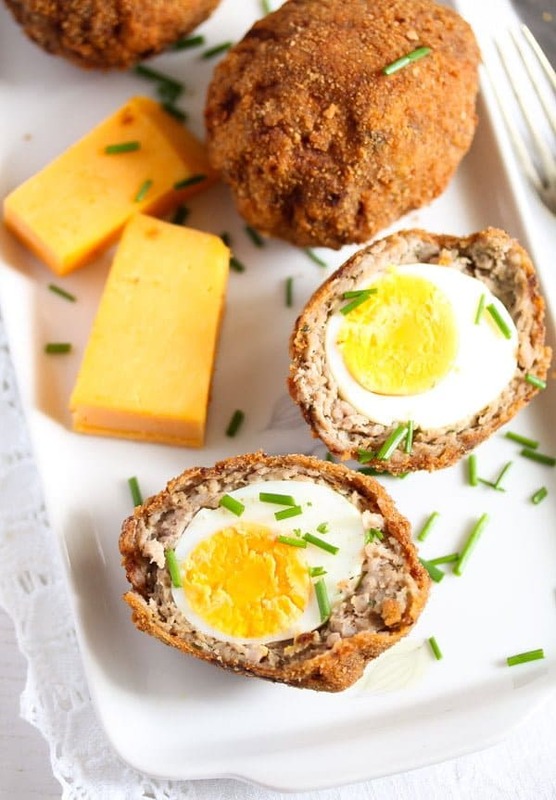 I have always wanted to make Scotch Egg! But I haven’t gotten a chance to LOL! This looks amazing! Happy Easter! i’ve never made these but i always find them to be so impressive! i love your herb and spice additions! I’ve never had this but they look super interesting and delicious.